SAN FRANCISCO — American Truck Dealers announced a new industry coalition to push for the repeal of the 12% federal excise tax on heavy-duty trucks. That tax, originally enacted in 1917 to help pay for World War I, currently adds about $12,000 to $22,000 to the cost of a new truck, according to ATD, a division of the National Automobile Dealers Association. 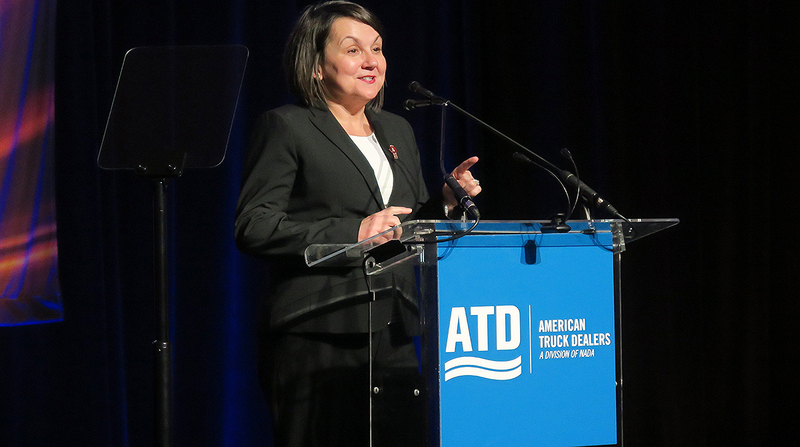 The added expense ultimately discourages fleets from purchasing new equipment that is cleaner, safer and more fuel-efficient than older models, ATD Chairwoman Jodie Teuton said here Jan. 25 at the 2019 ATD Show. The new coalition, named Modernize the Truck Fleet, is seeking to change that by lobbying Congress to repeal the 102-year-old excise tax while finding a replacement for that lost revenue to provide long-term funding for highway infrastructure and fleet modernization. In addition to ATD, other groups that have joined the coalition are the Truck and Engine Manufacturers Association, whose members include Cummins Inc., Daimler Trucks North America, Navistar Inc., Paccar Inc. and Volvo Group North America; NTEA, which represents the work truck industry; and the Truck Renting & Leasing Association. Teuton said the group also is working to bring more industry stakeholders into the fold. The current political environment could provide a unique opportunity for the industry to make the FET repeal a reality, she said. Members of the MTF coalition issued statements in support of the effort. “With an infrastructure bill as likely to pass as any piece of legislation in 2019, this is the time to put all of our combined energy into finding a way to replace the onerous FET,” TRALA President Jake Jacoby said. Repealing the tax would “lower barriers to deploying the cleanest and safest trucks available,” EMA President Jed Mandel said. Mike Joyce, a partner at legislative consulting group Total Spectrum, told ATD Show attendees that congressional leaders on both sides of the aisle have shown an appetite to move forward with an infrastructure plan. On average, the FET generates about $3 billion annually for the Highway Trust Fund, but that revenue is unpredictable from year to year, Joyce said. Last year, the tax generated more than $4.2 billion due to strong equipment sales, he said. Democratic leaders have tied infrastructure investment to climate change, a development that Joyce said bodes well for the proposal to repeal the FET, which would promote the deployment of cleaner trucks. “This is the time, this is the place to move that ball forward,” he said. Apart from the update on the FET repeal effort, ATD’s Teuton also reflected on a banner year for truck sales in 2018. “U.S. retail sales of Class 8 trucks were at historic levels, and order boards are filled well into this year,” she said. “Freight growth was robust and consistent, and dealers nationwide are selling some of the cleanest, most advanced trucks that we’ve seen. Teuton also reiterated the industry’s need to bolster its workforce, citing a “critical shortage of technicians at truck dealerships,” which can hinder their ability to serve fleet customers. “I’d like every truck dealer to help ATD get out the word: Dealership jobs are rewarding, they’re challenging, and they pay well,” Teuton said, adding that technicians at dealerships earn $61,000 per year on average.